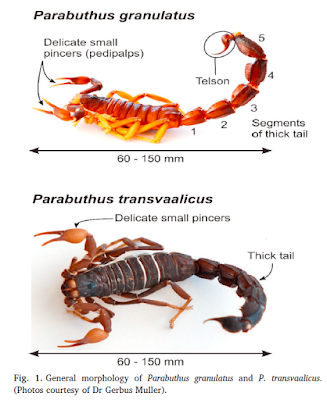 South Africa harbors a large diversity of scorpions, including many species in the medical important genus Parabuthus Pocock, 1890 (Buthidae). Carine J. Marks and co-workers have recently published a retrospective analysis of the scorpion cases managed by the Tygerberg Poisons Information Centre over a 10 year period. The main conclusion is that the incidence of severe scorpionism were low in this period. 65% of the sting cases had no or minor symptoms, mainly local pain. As usual, children may be more vulnerable and extra vigilance is needed in cases involving small children. The species involved in the study were usually not involved, but it is well known that Parabuthus granulatus (Ehrenberg, 1831) and P. transvaalicus (Purcell, 1899) are the most dangerous species in South Africa. Methods: A retrospective analysis was conducted of scorpion-related telephonic consultations to the TPIC over a ten year period (1 January 2005 to 31 December 2014). Data were entered onto a Microsoft Excel® spreadsheet and descriptive statistics are presented for all variables. Associations with severity of envenomation are presented as odds ratios (OR) with 95% confidence intervals (95%CI). Results: During the study period 52,163 consultations were processed by the TPIC of which 740 (1.4%) cases involved scorpion stings. Of these, 146 (19.7%) cases were deemed serious envenomations. Antivenom was recommended to be administered in 131 (90%) of these cases. Healthcare professionals made most calls (63%), but were less likely to phone for non-serious cases (OR 0.16; 95%CI 0.09 to 0.29). The Western Cape Province had the highest incidence of calls (6.9 scorpion-related calls/100 000 people). Adults (> 20 years) were victims in 71.4% of cases, and were more likely to experience less serious stings (OR 0.57; 95%CI 0.37 to 0.86). The TPIC was consulted within six hours of the sting occurring in 356 (48.1%) cases with a significant association to less severity (OR 3.51; 95%CI 1.9 to 6.3). Only 2% (15) of the scorpions were available for identification. Conclusion: The incidence of severe scorpionism to the TPIC was low. Care should be taken when children are involved and when calls are received more than six hours after the sting. TPIC consultants as well as healthcare professionals working in semi-arid regions should be aware of these high risk populations.